The vice-chancellor said in an open letter that he would be forced to consider a Cambridge-specific scheme if national pensions talks fail. In light of an intractable national pensions dispute which spurred strike action at universities nationwide, University of Cambridge Vice-Chancellor Stephen Toope has said that he will “consider whether there is scope for a Cambridge-specific scheme” which may either be within or outside of the Universities Superannuation Scheme (USS). Toope also said that the University is “prepared to consider assuming the costs of additional contributions [to USS] in the short-term should no other option be viable”, but noted that “this approach would likely require trade-offs and cuts in other parts of the University”. In an email to students and members of the university, Toope urged national parties “to agree [to] a pragmatic solution to bring to an end the current dispute”. He recommended a sector-wide approach which retains a defined benefit element, but is combined with a defined contribution scheme similar to the Cambridge University Assistants’ Contributory Pension Scheme (CPS). CPS operates as a hybrid scheme of both defined benefit and defined contribution pensions, which are added together upon retirement. “The current situation cannot go on”, the vice-chancellor wrote, and added, in reference to national talks, “There has to be compromise”. Should negotiations fail to decide on and deliver a sector-wide scheme, he would then consider a scheme specific to the University, emphasising that there would be “serious obstacles to such an approach”. 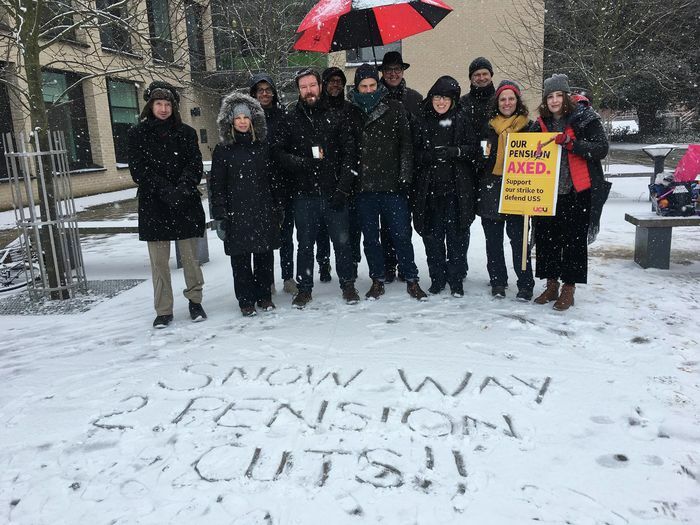 Universities UK and UCU are expected to continue negotiations over proposals to staff’s pensions as strike action resumes next week. The current proposals presented by UUK involve the replacement of defined benefit schemes with defined contribution schemes, which it believes will narrow the USS estimated deficit of £6.1bn. The UCU has criticised the elimination of defined benefits schemes, which offer a guaranteed level of income upon retirement, with defined contribution schemes, the value of which depends on returns from underlying investments in the stock market. It has cited analysis by actuarial consultants First Actuarial that staff could be as much as £200,000 worse off under defined contribution schemes, and disputes the UUK’s estimate of the USS deficit as overly pessimistic. The UCU called for strikes to continue as negotiations resume with UUK. The industrial action will affect every teaching day for the remainder of Lent term, except for Friday 9th March. Varsity has contacted the Cambridge UCU for comment.